NOTICE (03/18/2019) -- The water quality and discharge components of this site were discontinued on March 18, 2019 due to lapse in funding. Although historic data will remain accessible, no new water-quality or discharge data will be collected unless one or more new funding partners are found. Users who are willing to contribute funding to continue operation of the water-quality and discharge components of this gage should contact Rob Breault of the USGS New York Water Science Center at 518-285-5658 or dc_ny@usgs.gov. LOCATION.--Lat 40°34'25", long 73°53'08" referenced to North American Datum of 1927, Kings County, NY, Hydrologic Unit 02030202, at Metropolitan Transportation Authority Marine Parkway Gil Hodges Memorial Bridge, near Floyd Bennett Field. PERIOD OF RECORD.--November 2014 to current year. Elevation records published since October 2002. Velocity and velocity-sensor depth records for November 2014 to current year are unpublished and available in files of the Geological Survey. GAGE.--Water-stage recorder and acoustic velocity meter. Datum of gage is NGVD of 1929. ELEVATION WY 2013: Records excellent, except those for Oct. 1-28, Oct. 30 to Jan. 17, Feb. 8-26, Feb. 28 to Mar. 6, Mar. 11 to Apr. 17, Aug 6-9, and Aug. 12 to Sept. 30, which are good; and for Oct. 29, Feb. 27, and Mar. 7-10, which are fair. Satellite and telephone elevation, velocity, and velocity-sensor depth telemeters at station. Streamflow at this site is affected significantly by astronomical tides. By convention, the U.S. Geological Survey has established ebb (seaward) flows as positive flows and flood (landward) flows as negative flows. Unfiltered 6-minute stage, velocity, and discharge data are available upon request. Maximum discharge, 404,000 ft³/s, Mar. 17, 2016; maximum elevation, 11.75 ft, Oct. 29, 2012; minimum discharge, -383,000 ft³/s, Mar. 20, 2015; minimum elevation, -5.23 ft, Mar. 9, 2005. EXTREMES OUTSIDE PERIOD OF RECORD.--Storm tide of Dec. 11, 1992, reached an elevation of 8.9 ft, from high-water mark at site 0.5 mi south-southeast. PERIOD OF RECORD1.--November 2014 to current year. Sampling depth records for November 2014 to current year are unpublished and available in files of the Geological Survey. 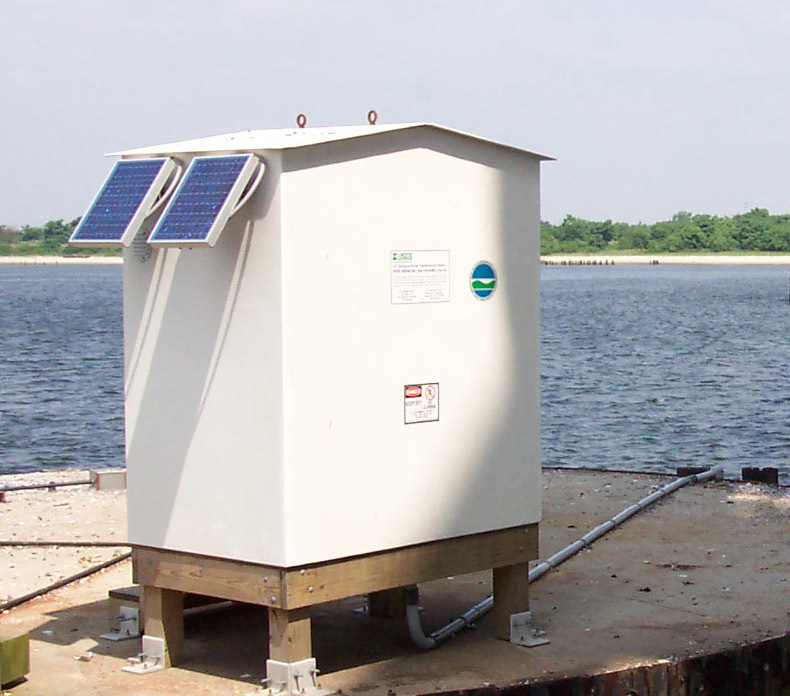 INSTRUMENTATION1.--Water-quality monitor provides 6-minute-interval readings collected near mid-water depth. Salinity record computed from specific-conductance readings. REMARKS1.--Satellite and telephone water temperature, specific conductance, turbidity, and sampling depth telemeters at station. Interruptions of record were due to malfunction of water-quality monitor or sensors. EXTREMES FOR PERIOD OF RECORD1.-- WATER TEMPERATURE: Maximum 28.2 'C Aug. 14, 2016; Minimum -1.7 'C Feb. 15-16, 21, 2015. TURBIDITY: Maximum 59 FNU Sept. 14, 2016; Minimum <0.1 FNU several times throughout the period of record. Elevation observations and tidal predictions for this station are reported to NGVD 1929. To convert data to NAVD 1988 subtract 1.10 ft. To convert data to MHHW datum subtract 3.75 ft. To convert data to MLLW datum add 1.84 ft. These corrections vary from site to site. NGVD 1929 is the National Geodetic Vertical Datum of 1929, formerly called "mean sea level" or "Sea Level Datum of 1929." NGVD 1929 was a general adjustment of the first-order level nets fit to mean sea level at 26 tide gages in the US and Canada. NAVD 1988 is the North American Vertical Datum of 1988, which is a geodetic datum derived from a general adjustment of the first-order level nets fit to 1 tide gage in eastern Canada. MHHW is mean higher high water, which is a site-specific datum determined by averaging the highest of the 2 high tides that occur each day over a 19-year tidal epoch. For tide gages with less than 19 years of record, this datum is estimated by correlation with long-term tide gages. MLLW is mean lower low water, which is a site-specific datum determined by averaging the lowest of the 2 low tides that occur each day over a 19-year tidal epoch. For tide gages with less than 19 years of record, this datum is estimated by correlation with long-term tide gages. This station managed by the NY Water Science Center Coram.